A study conducted by the Israeli Foreign Ministry recently revealed that India is the most pro - Israeli country in the world, not the United States, neither Canada, France, Britain or Germany countries with the best diplomatic ties with Israel. No it is India. According to the survey 58 percent of India's citizens have a positive view toward Israel, while only 56 percent of the U.S. population a population that is considered to be the most pro - Israeli in the world. Looking at the results more deeply, and remember that in India, there is a 10 percent minatory of Muslim population. The pro-Israeli results in India are even more impressive. Apparently the poll results seem very bizarre, where India came suddenly, a giant country in South Asia, with no local Jewish population, and with strong connections with the Third World. And I still didn't mention that India and Israel did not have any diplomatic relations with each other until the 90's. And only in 2003 was the first time an Israeli Prime Minister visit India. But the fact is that the results should not be so surprising, a deeper understanding of India, the Indian history, the Indian population, India strategic challenges, and India place in the world, show that India and Israel share a lot more than we imagination, maybe we could say both countries have the most similarities between two countries in the world. 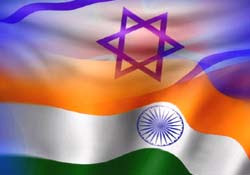 India and Israel's fate is tied together from the beginning of their modern way, both countries received their independence in about the same time, India in 15 August 1947 and Israel in 14 May 1948 both as a result of a long and bloody of independence war. India fought the Muslim community within and its neighbor Pakistan (East & West), Israel fought the Arab population within and its neighboring Arab countries. The outcome of the war in both countries were quite identical, a division of the existing region. Both countries are former British colonies. British influence seen almost in all aspects of life today, especially the political system, form of election and the judicial system. In both countries before the British rule there was a long Muslim rule began about the same time, India was the Mughal Empire that ruled the country since 1526 while in Israel it was the Ottoman Empire ruled since 1517. Nationalism in both countries was built not on the basis of ethnic or historical, as in most countries but on religious. In both countries the unifying identity among all parts of the country is religious identity. India used the Hindu religion as a focus for the connection between all the different peoples and identities within it. Israel used the Jewish identify to unifying all its citizens, and many refugees who came since its establishment. Moreover, India and Israel also are unique countries in the global landscape in which in both of them there is a religious majority that does not exist anywhere else in the world. Israel is the only country in the world with a Jewish majority, and India is the only country in the world with Hindi majority. And the two countries use it to promote their place in the world and to maintain the rights of their religion believers in the rest of the world. The economic life process of the two countries since their establishment until today looks identical. In there early years the two countries supported the socialist economic system. However both countries refrained from joining the Soviet bloc led by the Soviet Union. When Israel turned toward the West and India turned to the Non-Aligned Movement. In the eighties the two countries began to abandon the socialist ideology and move toward a free market, to the point that nowadays the two economies are from the most capitalist in the world. In Both countries 1977 is a turning point in politics and democracy. In India and Israel one party controlled the country since its independence the party was the dominant factor in the establishment and independent moment. The Mapai party in Israel and The Congress Party in India. 1977 was the year the two countries broke the one-party system and elected the opposition for the first time. Both countries are democracies, a form of a regime that not characterizes the region where they reside. Israel is the only democratic state in the Middle East. India is the only democratic state in South Asia. Looking at the whole of West Asia, you can see that from the Mediterranean coast to the shores of Bay of Bengal, India and Israel are the only two democracies on the continent. Moreover, not only Israel and India are both democracies, they are the only two democracies established after World War II in process called "second wave of democracy", and managed to maintain the democracy to this day. When it comes to strategic issues, the similarity between the two countries only growing. The two countries are conducting an unending conflict against a Muslim enemy. India with Pakistan, and Israel with Arab countries. In both cases the conflict takes the form of total wars at the beginning and of terror in recent years. The two countries waged war with all neighborhood countries. Israel with Syria, Lebanon Jordan and Egypt. India with Sri Lanka, Bangladesh, Nepal and China. And the two countries signed two peace agreements with it neighboring Israel with Egypt and Jordan. India with Bangladesh and Sri Lanka. Also as a result of these wars, both countries still hold land that is not recognized by the world of their own, in Indian Kashmir, and the West Bank in Israeli case, when the concept of two countries about the area is the same historical right. Of course there a large difference between the two countries, India is a huge state with the second largest population in the world, while Israel is a tiny state in its territory and population as well. India is a Third World country, still has to deal with poverty, despite the economic boom in recent years. While Israel is a country where per capita income is among the highest in the world. But apparently the many similarities between the two countries, more powerful than the difference and politics, Indian support in Israel is deeper than political or economic interests of the short term, has expressed so clearly at the survey. Hopefully the leaders in both countries, especially in Israel, will know to take these many similarities, and make the connection between the two countries to a strategic relationship even stronger then the Israeli-American relationship. I personally believe that Israel and the USA would do better to drop its UN membership. As a whole the so called United Nations system is corrupt entity that is a tool used as a weapon against the USA and Israel for the most part. I am glad that India is so positive towards you and at the same time saddened at the USA lack of courage on the administration as far as I am concerned has lead the media assault against Israel. India will be blessed and the USA will not because of this. As an Israeli I glad India love us, however, when India is the most pro-Israeli in the world it is a little worry me. I am an Indian and I am huge fan of Israel! We hindus and nationalist Indians love the way you deal with the Arabs. We know of the legendary wars you fought, the daring operations of the Mossad and your advanced technology. These are traits that we admire. भारत और इसराइल हमेशा के लिए!